I had a great update post planned for this week. While recovering from the seemingly endless “unstitching” that it will take to fix my epic failure, I decided I would spare you all from what would otherwise be a rant of frustration. (Also, I’d like to keep my posts safe for work and family friendly.) So for the time being, I’ve had to step away from the needle and thread. In the meantime, I thought I might post the best tutorial posts I’ve come across & some free patterns as well. A few of these tutorials I mentioned in my post from last week, and are some the most helpful I found in beginning. Storypiece is becoming one of my favorite cross stitch sites. The basic tutorial is incredibly helpful for beginners & she offers some very cute patterns for free. The Crafty Mummy also offers an in depth post on how to stitch & some great tips for beginners that I never would have thought of. Like how to end a row that makes it easier to continue onto the next row. I came across this beginner tutorial post on Hub Pages that details the different types of stitches you will need to know. DMC has a bunch of posts that are helpful for beginners and for more advanced stitching. They also have a very in depth post on reading patterns. These embroidery posts & handstitching posts look like beyond simple cross-stitching patterns. I can’t finish a My 1st Stitch Kit, so those patterns are beyond my level of expertise. Now when I first entertained the idea of cross-stitching, I was on Etsy and looking for Stephen King stuff for my office. I had came across an IT pattern and decided I wanted to make this for our collection. I also found out how many cross-stitching patterns are available on Etsy and searched for free patterns that I may one day want to try out, should I continue along with this hobby. I just so happened to find a cross-stitching blog by Tiny Modernist and she has some adorable patterns for free. Country Living has several free patterns available. They aren’t all to my taste, but there are a few cute patterns I would stitch. 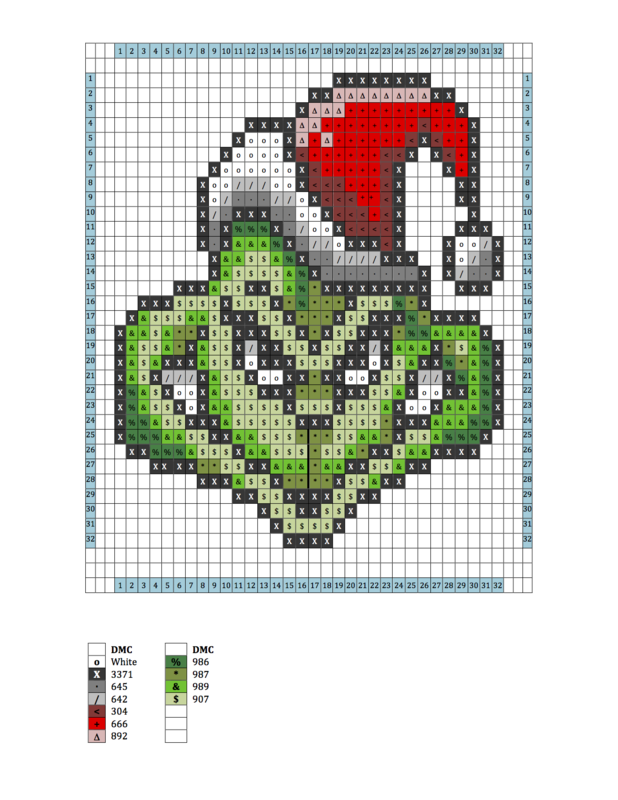 For Christmas time, I came across a pattern of The Grinch. And for Thanksgiving, you can Give Thanks. Deviant Art is a very cool site and user Syra1974 has a Lisa Simpson pattern, and several other really awesome Disney patterns, like Bambi. DMC offers a bunch of free patterns, as does Crossstitching.com. I also came across this site that has albums full of free patterns ranging from Aliens to Zodiac signs. Splendid Shambles complied really awesome lists of the Star Wars and Harry Potter patterns available on Etsy. For those who like a little sass and risque patterns, stephXstitch has some very “cheeky” patterns available. Naughty word warning. Cuddle Up Creations has some very intricate and beautiful patterns available. I had stumbled upon a dragon pattern that I would love to be able to do some day to represent my love for Skyrim. I have been curating tutorials & patterns on Pinterest on my cross-stitching board. Feel free to check it out for even more! Next week, I will have an update on my own stitching progress and a sneak peek of my next hobby!! HA! Oh my goodness… I’ve uttered some not so family friendly things and had to step away from the needle and thread to avoid throwing it against the wall… especially when knots are involved. It happens to the best of us and it gets better I promise! Can’t wait to see your finished owl.